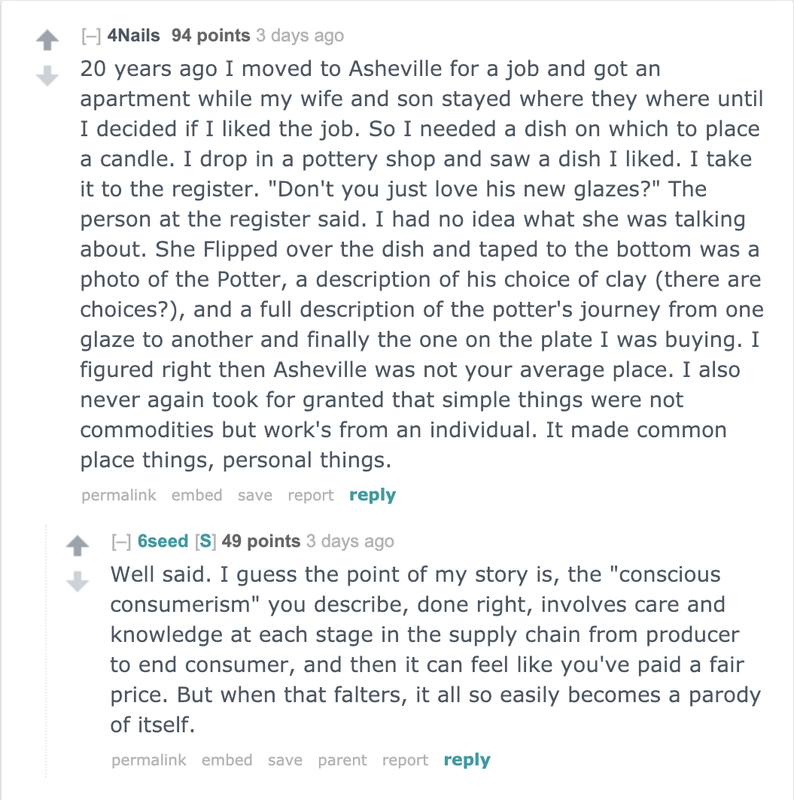 20 years ago I moved to Asheville for a job and got an apartment while my wife and son stayed where they where until I decided if I liked the job. So I needed a dish on which to place a candle. 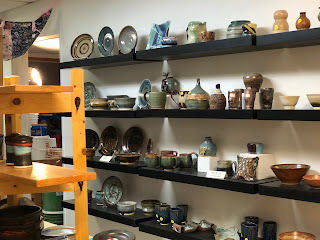 I drop in a pottery shop and saw a dish I liked. I take it to the register. "Don't you just love his new glazes?" The person at the register said. I had no idea what she was talking about. She Flipped over the dish and taped to the bottom was a photo of the Potter, a description of his choice of clay (there are choices? 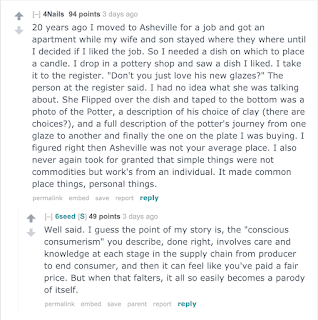 ), and a full description of the potter's journey from one glaze to another and finally the one on the plate I was buying. I figured right then Asheville was not your average place. I also never again took for granted that simple things were not commodities but work's from an individual. It made common place things, personal things. Me: How would I choose? Him: Uh . . . you just tell me which you want, and I get it for you. Me: What I meant was, you said there are two choices, but they are very similar sounding, can you help me decide which one I might like? Him: well, they are both going to have deep, floral, and fruity flavors. Join us for public conversations about research and projects connected to craft studies! 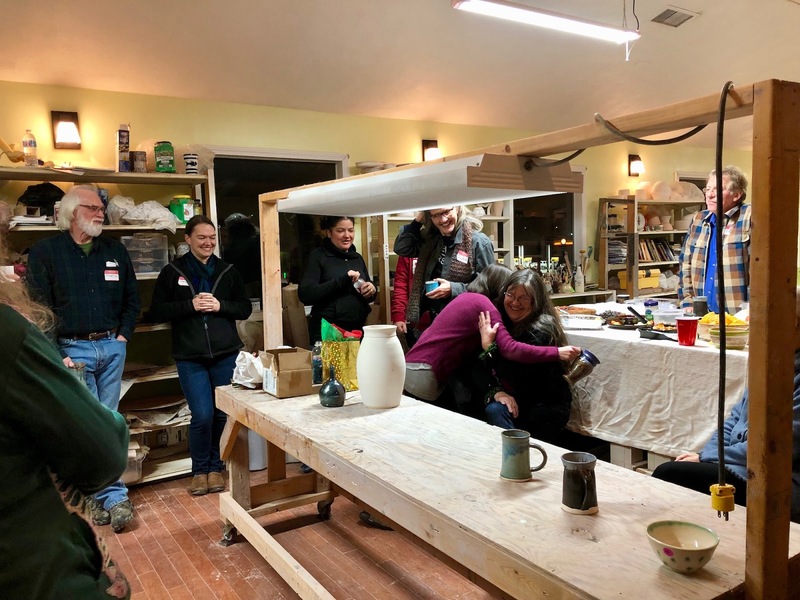 Craft Conversations is a five-part series organized by the MA in Critical and Historical Craft Studies and hosted at the Center for Craft, Program Founding Partner, in downtown Asheville. These are not formal lectures. 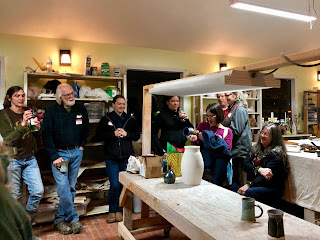 Instead, we invite you into the evening classroom of the MA in Critical and Historical Craft Studies, Warren Wilson College, where you can hear how people conduct, analyze, share, and discuss their work on craft history and theory. Programs begin promptly at 6:30 PM and end at 8:30 PM. Programs are free and open to the public; Reservations requested (see link below); light refreshments will be available. You will have the opportunity at this final conversation in the series to hear from Warren Wilson College President Lynn Morton, MA Program Director Namita Gupta Wiggers (USA), and Core Faculty Benjamin Lignel (FRANCE) and Linda Sandino (UK). Applications now being accepted for the 2019 season of the Ooh La La Curiosity Market, held in Pritchard Park in downtown Asheville from May through September. Market dates in the flyer above. 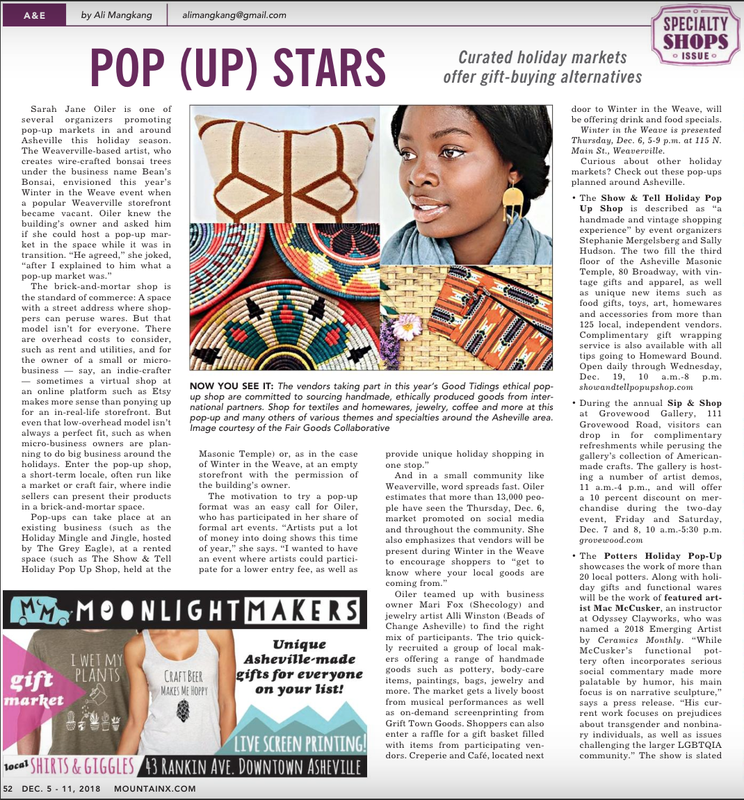 Please e-mail oohlalacuriositymarket@gmail.com for information about becoming a vendor in this years markets. I’m in Asheville but will be willing to travel. Looking for a wheel with pins so I can use a bat system. Have a wheel for sale or a lead on one? Contact Beth at curlychords@gmail.com. Please email Ruth for any specific questions about class content. Please contact Linda Powell for registration and payment. Winter classes begin January 7. Private lessons and Gift Certificates available! 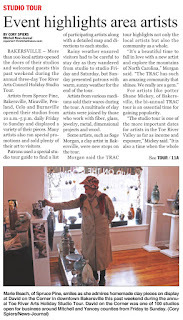 For more information, please visit http://www.odysseyclayworks.com, or call 828-285-0210. 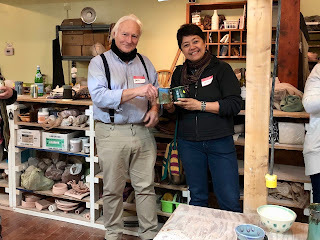 Thanks to Linda Powell and everyone at High Country Ceramic Arts (HCCA) for an awesome end-of-year Clay Club! Special thanks to John Silver of Homeplace Beer Company in Burnsville for providing the keg of beer - as far as I know this was our first kegger, and it was pretty great. Linda has set up a gallery space since we held our last Clay Club at HCCA - check it out in the photos below or in person when you're in Burnsville. And Ruth Fischer Rutkowsky shared information about her upcoming sculpture class at HCCA. Look for more details about that here on the blog soon. 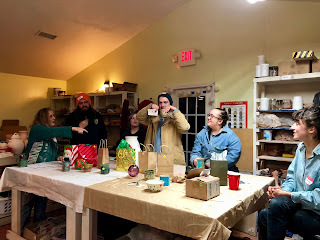 We had our traditional mug/cup/object exchange - there were some first-timers and some old hands and everyone looked happy with their exchanges. I'm really loving my Pam Witters mug! We don't currently have a host for January - if you're interested in hosting or have a suggestion for a meeting location, let me know. I know this is a busy time of year - hope the upcoming holidays give those who need it a break. See you in the new year! 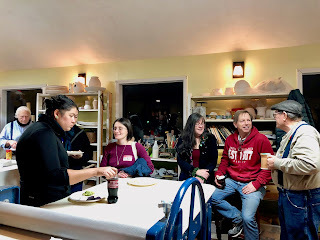 Clay Club on Tuesday (~with a beer update~)! 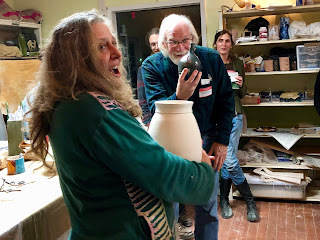 Clay Club is tomorrow, Tuesday December 18th, from 6-8 pm at High Country Ceramic Arts in Burnsville. Thanks again to Linda Powell for hosting us! Note from Linda: No need for anyone to bring beer. John Silver, Homeplace Beer Co., is treating us to a keg of Brown Mule! Registration & Ticket Sales NOW OPEN! In partnership with the University of South Carolina's McKissick Museum, the Newberry Arts Center - NAC is proud to announce the presenters for the 5th Annual South Carolina Clay Conference. This annual conference is for professional and amateur clay artists and takes place in Newberry, South Carolina. The conference also hosts one of the largest displays of South Carolina clay art available for sale. 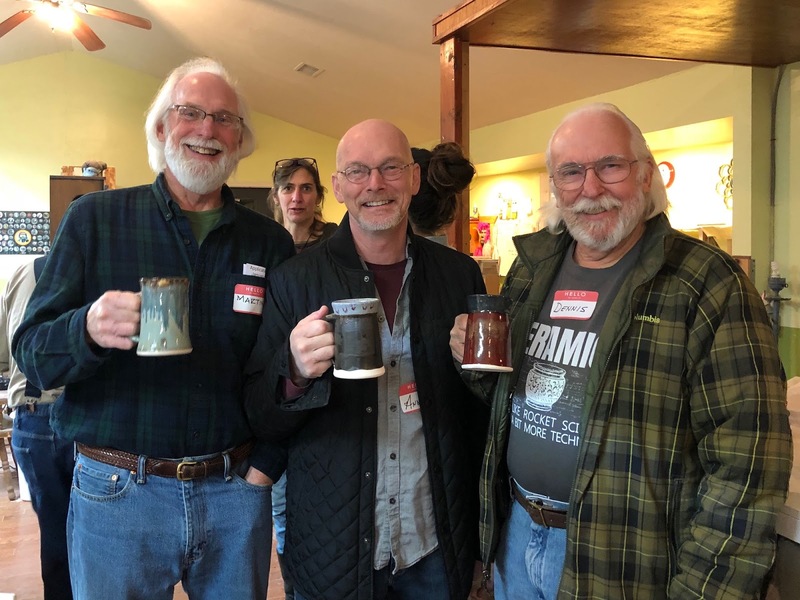 Craven Arts Council is now accepting applications for artists to the 2019 Eastern Carolina Pottery Festival! Located at the NC History Center for Tryon Palace in downtown New Bern, this well attended festival allows artists the chance to meet the public, showcase what makes their work so special and unique, and sell the work directly without consignment fees. This year's festival will take place April 13, 2019, from 9am to 5pm. CAC&G has eliminated the entry fee for guests into the festival in hope of raising attendance, and is currently working on a new marketing plan to extend our reach in to the community. The festival will also occur the same weekend at the highly anticipated New Bern Historical Society's Spring Homes Tour, and Juice on the Neuse, a local wine festival. The hope is to create a destination weekend through cross promotion and advertising, so that we can insure a successful and rewarding weekend for our our vendors. 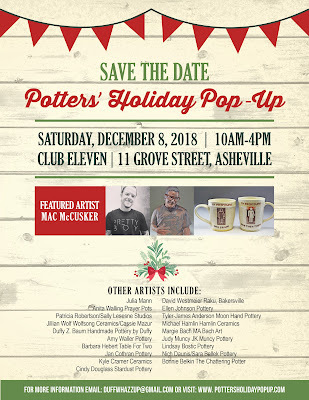 Brevard’s Potters’ Row will hold its annual Holiday Open House Dec. 14-16. Hours are 9 a.m.-5:30 p.m. on Friday and Saturday and from 1-5:30 p.m. on Sunday. 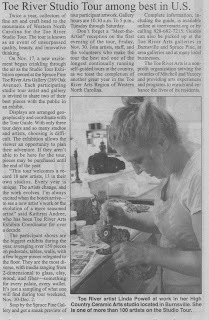 Shops participating include Duckpond Pottery, Mountain Forest Studio and Mud Dabbers Pottery. Potters’ Row shops are located between two and four miles south of downtown Brevard on U.S. 276. 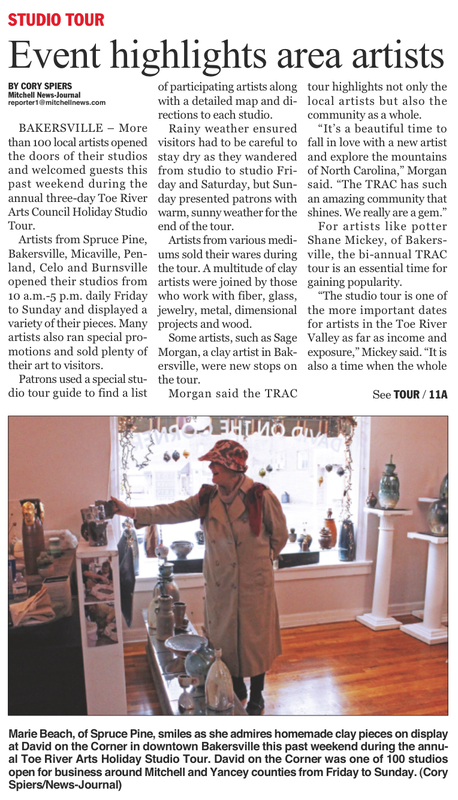 Highlights of the open house will include locally produced pottery, demonstrations, refreshments and live music. Duckpond Pottery will showcase the culmination of a year-long adventure making wood-fired pottery from locally gathered Transylvania County clay. Potter Nick Friedman also will show his new line of functional terra cotta pots. 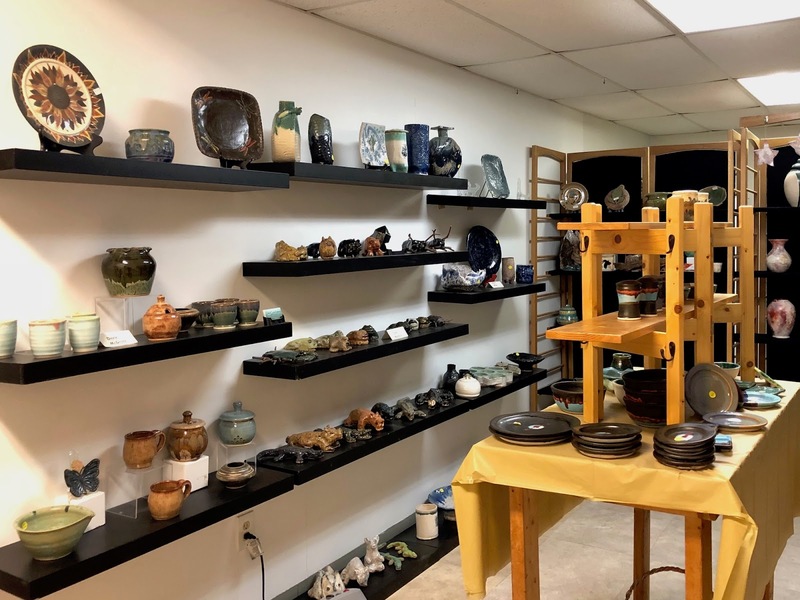 Other featured artists are Jerry Trapp with wabi sabi side tables, Paula Patane with jewelry and sculpture and Theresa Reuter with raku-fired jewelry. Saturday afternoon Duckpond will host members of the Pretty Little Goat Band. 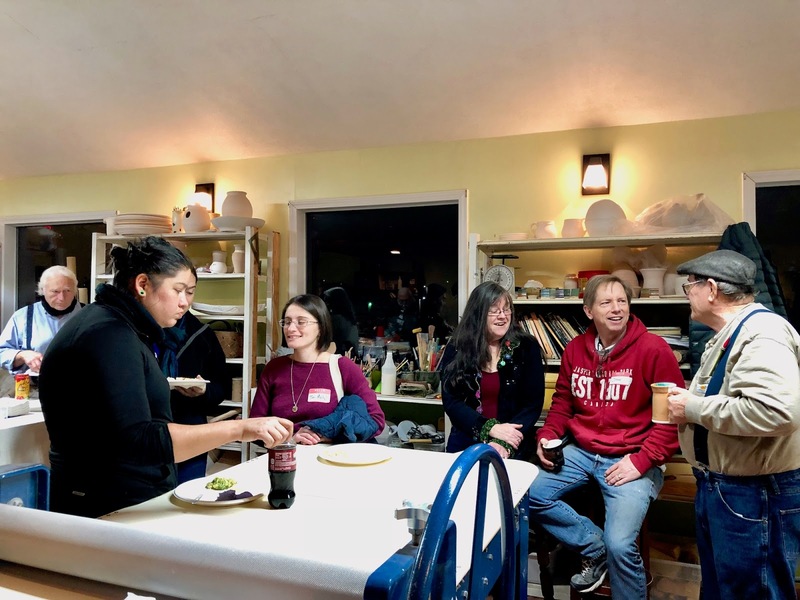 On Sunday, the pottery will have its wood-fired pizza oven going for those who would like to bring a few toppings and make their own pizza. The functional and sculptural pottery of Mary Murray will be available at Mountain Forest Studio. 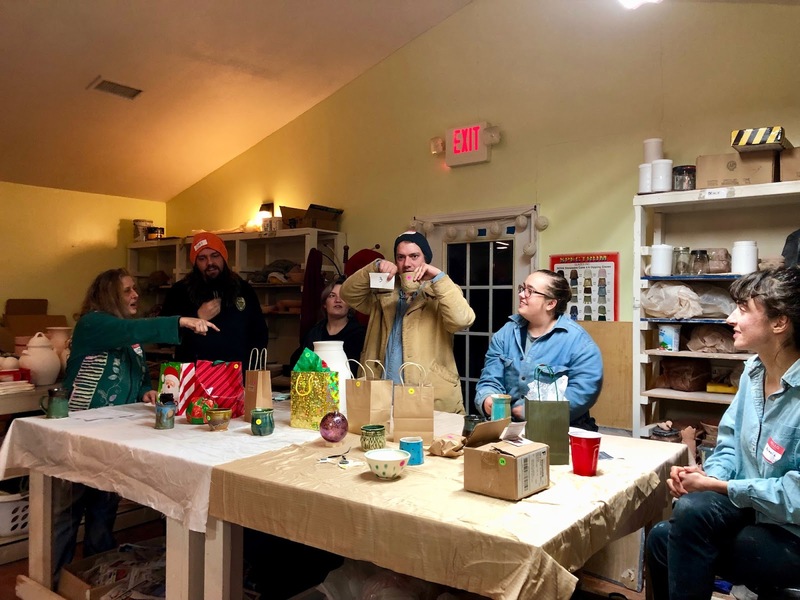 The shop showcases handmade items by local artists, including teddy bears by Sam Cope, quilted wall hangings by Claire Cope, pottery by Susan Phillips and Zelda Davis from The Flying Cat Studio in Dillsboro and by Jody Temple of Saluda. A variety of wood work, baskets, quilts, copper enameling and wooden utensils also are available. Refresh-ments will be served. Mud Dabbers Pottery features the work of more than 30 area potters. Wheel-throwing demonstrations, refreshments and live music will be offered in the Carwile-Dodson Studio located next door to the gallery. On Friday, musical entertainment will be provided by All Natural Jam (9-11 a.m.), The Empty Room String Band from (11:15 a.m.-1:15 p.m.) The Blue Ridge Bakery Boys from (2-3:30 p.m.) and The Cracked Pots (3:45-5:30 p.m.). On Saturday, muscians will include Next of Kiln from (9-11), Marc Brown (11:15 a.m.-1:15 p.m.), Celtic Conspiracy (1:30-3:30 p.m.) and Road Apples (3:45-5:30 p.m.). Sunday’s musical entertainment will be provided by East Fork Gals (12-2) and Trillium (2:15-4:15 p.m.). For more information on the Open House, call (828) 884-5131. 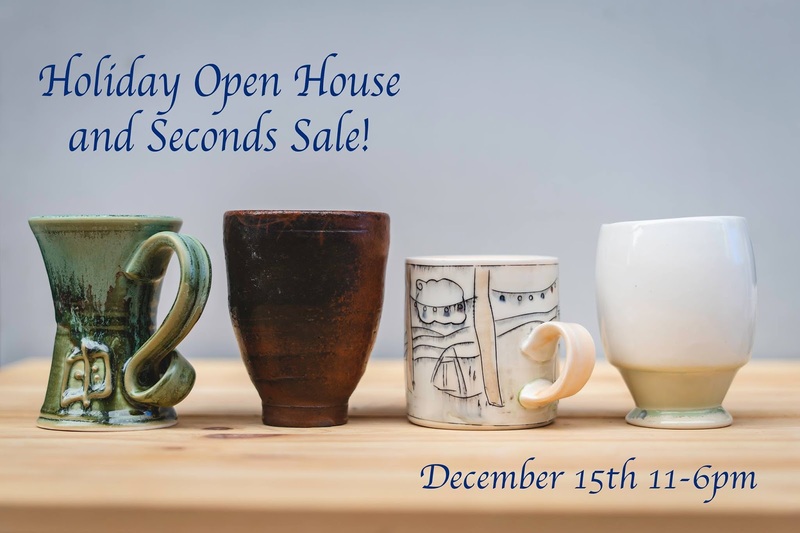 Join us Saturday December 15th for our Holiday Open House! We will be celebrating in style with one of our fabulous seconds sales! Enjoy 50-80% Off Seconds and Overstock from our Odyssey artists. 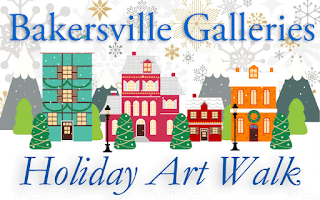 Prices are low and the artwork is beautiful, so we recommend arriving promptly at 11am and shopping quickly. Also enjoy Buy-One-Get-One FREE on all of our handmade Odyssey flatware, free kids activities and free beer! How can you beat that? The event will take place at Odyssey Clayworks (236 Clingman Avenue Extension) at 11:00 AM and will continue until we close at 6:00 PM. This special holiday edition of our seconds sale is truly special, featuring the widest selection we have ever had of discounted seconds and firsts for the holidays. In other news, it's so good to have a few copies of Amazing Glaze in hand! We already knew it was a beautiful book, but it looks even more beautiful in person. Thank you to all who have pre-ordered your copies. 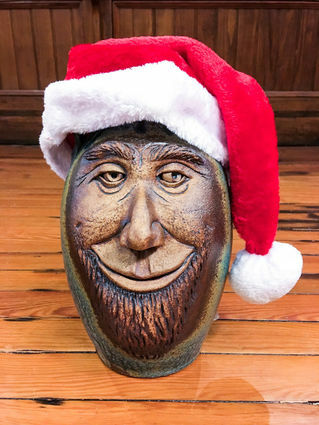 If you haven't gotten yours yet it will make an excellent Christmas gift to any pottery lover in your life! We have a handful in stock in the gallery, come by and grab your copy this weekend or order online. Gabriel will be signing copies from 12-1pm on Saturday. 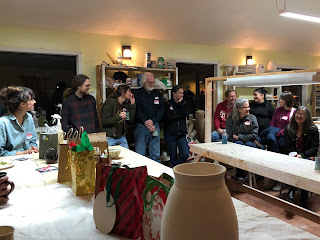 December Clay Club will be at High Country Ceramic Arts (HCCA) in Burnsville next Tuesday, December 18th at 6 pm (note that the day is different from our usual schedule). Thanks to Linda Powell for hosting us! In addition, Linda will talk with us about teaching opportunities at her studio. We'll have our usual potluck, so bring food to share. Clay Club is BYOB, so bring drink, too. Carpooling: if you’re interested in carpooling, you can leave a comment here on this blog post or on this facebook post, or let me know and I will put folks in touch. 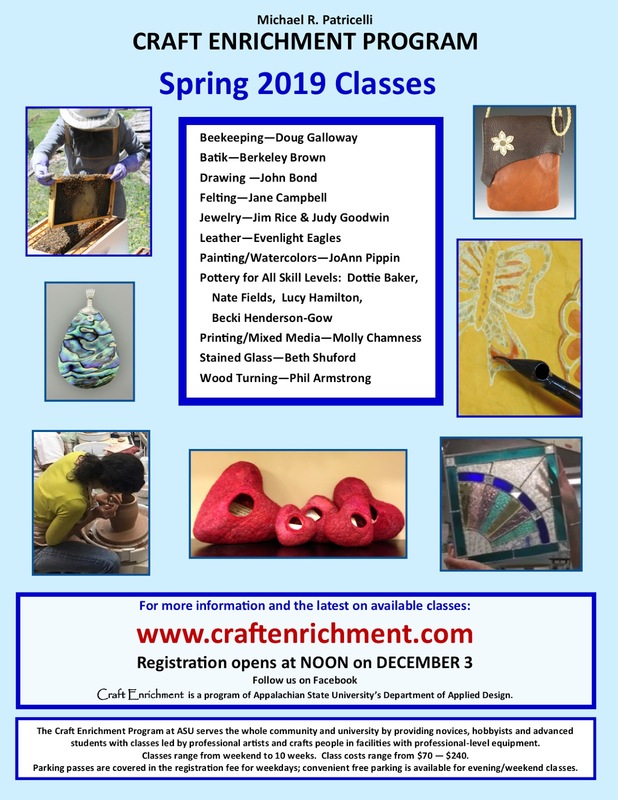 The Craft Enrichment Program offers affordable community craft classes taught by craft artists with local and regional reputations. Most classes are held on the campus of Appalachian State University in Boone, North Carolina. Whether you are a novice or an advanced student, our small, lively classes provide professional-level equipment and individual attention from instructors who are committed both as teachers and craft artists. Come and discover your artistic signature. 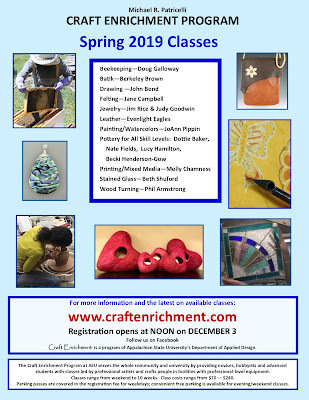 • Craft Enrichment classes are open to everyone 16 years old or older. Affiliation with the university is not required. • Classes are highly affordable. Materials for class projects are included in most registration fees. • Parking passes are included in the registration fee for weekday classes. Free, convenient parking for evening and weekend classes is readily available. The Asheville-based Campaign for Southern Equality (CSE) does amazing work across the South - it's awesome to see Clay Clubbers and other makers participating in this event. 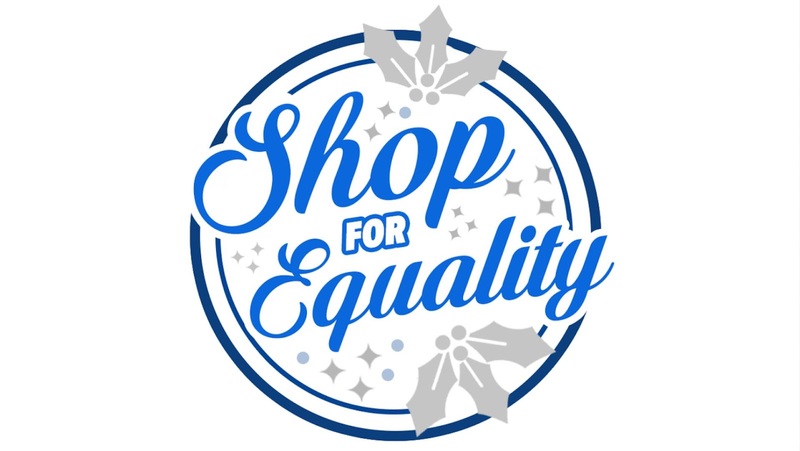 CSE is hosting its second annual Shop for Equality on Tuesday, December 11, 2018. 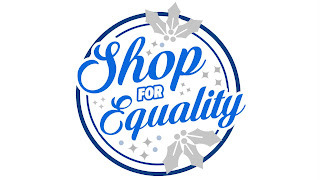 Participating Asheville-area businesses will donate at least 5% of proceeds to CSE and all funds will go towards our work for full LGBTQ equality across the South. 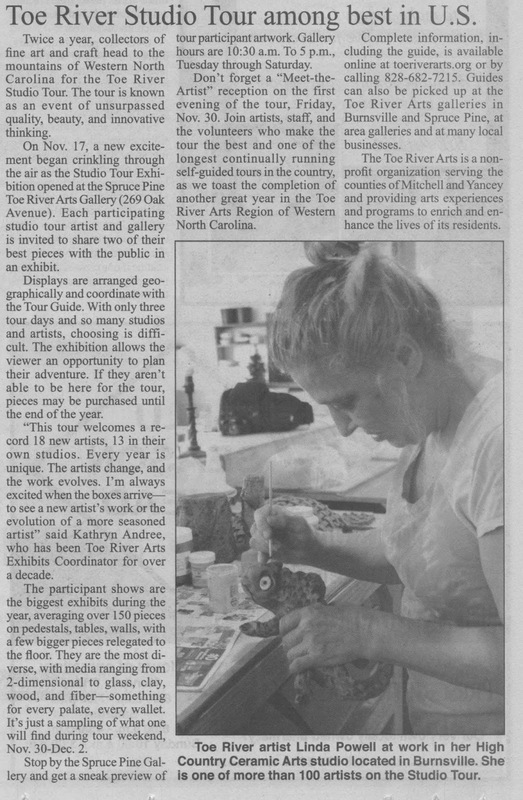 Excellent time to come out; see what's happening in town, check out some great artwork, eat some wonderful baked goods at Southern Ridge Cafe (plus hors-d'oeuvres at the galleries), chat with folks and just basically enjoy the evening before the big snowstorm hits and you're home eating all the eggs and milk and bread you bought for the potential snowpocalypse (sounds more like a recipe for french toast then anything else). 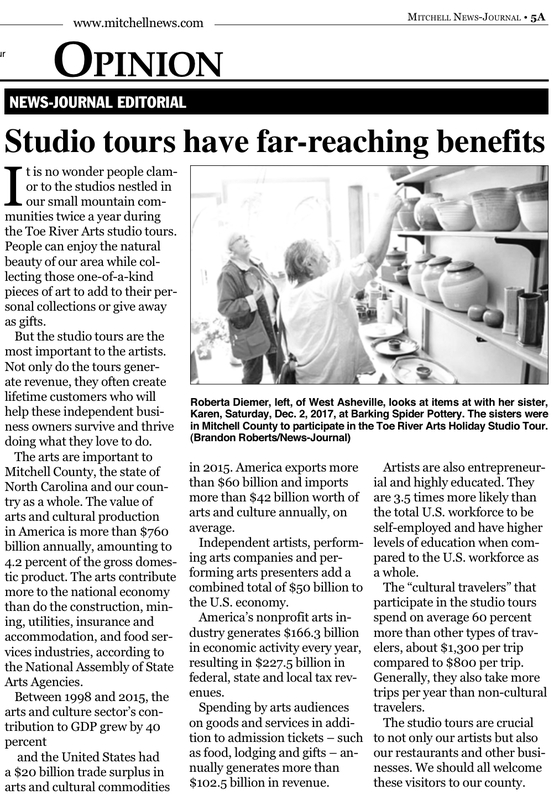 And last week the Yancey Times Journal featured a photo of Linda Powell of High Country Ceramic Arts in a front page story about the studio tour - I can't find it online but the print version is below (click to enlarge). 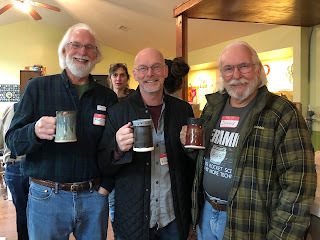 We're celebrating the end of the season with 3 of my favorite ceramicists!! We titled this group show "Reinventing the Classics - Modern Functional Ceramics Based on Historic Styles”. Not the shortest heading but so apropos. Melanie Sherman's work is super (and I mean SUPER) decorated in the Rococo style where more is definitely more; gold bling, patterns, delicate paintings... all on every square inch. It's like a sugar rush for the eyes. Mike Stumbras is more subdued; elegant but more subtle. His is much more Baroque in nature with flourishes on the handle and raised embellishments on the body. The work really has that sense of elegance and grandeur - and, it's all high fired with soda added to create that aged and atmospheric look. Lovin it! Blair Clemo is for you more modern Art Deco appreciators! He's super geometric in both form and decoration yet he also has this undulating clay that gives his work a soft but noticeable texture that disrupts the patterning adding another layer to visual drama. Super classy and fun. It is such a great show and we're thrilled to have them at the gallery, plus having the 'historic styles' unite them really has made it great to see together. So, if you do get a chance; stop by the gallery and tell us what you think; and if you can't, doing the online perusing is good too. And Happy Holidays to you all!!! 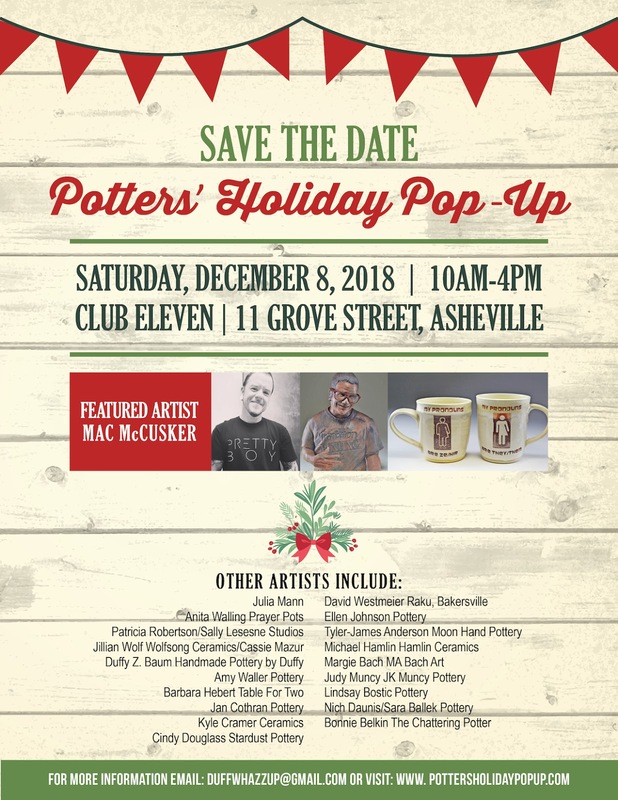 Some of the best potters, ceramic sculptors & Raku artists will be under one roof from 10AM-4PM at Club Eleven 11 Grove St this Saturday December 8th. 11 Grove St is located between S French Broad & Asheland Ave. Free parking across the street in downtown Asheville. Holiday gift giving on your mind? Great opportunity to see some of your favorite artists in one location. 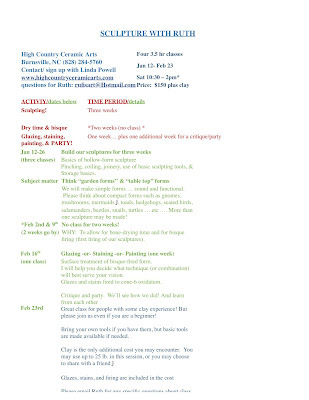 We hope you will accept our invitation for all local & regional artists, craftspeople, food vendors, and other commercial vendors to apply for space at the 73nd Annual NC Rhododendron Festival Arts and Craft Fair, held along the Creek Walk in Bakersville, North Carolina on Saturday and Sunday June 22-23, 10am to 5pm. 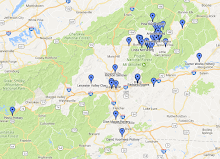 The NC Rhododendron Festival draws hundreds of visitors from all over the region and features the Rhododendron Festival Pageant, the Arts and Craft Fair with food vendors and live music throughout the day, a classic car show, a 10K run, 2 nights of street dancing, and the famous Ducky Derby. An application is attached to this email. Also attached for food vendors is an application for Temporary Food Service that must be completed and approved by the Mitchell County Health Department by 1 June 2018 for any food service to be provided. You may obtain additional applications and information at http://ncrhododendronfestival.org, send a request to drdanbarron@gmail.com or call 828-284-1914. Please note that as per N.C. Gen. Stat. § 66-255, everyone who sells tangible property at a festival is required to collect and remit NC state & county sales tax, and to have and display their Sales & Use Tax Certificate of Registration at their booth. Failure to comply with this statute is a Class 1 Misdemeanor offence and the individual can be charged as such. If you don’t have a number, registration is free and can be completed online at w̶w̶w̶.̶d̶o̶r̶n̶c̶.̶c̶o̶m̶/̶p̶r̶e̶s̶s̶/̶2̶0̶1̶2̶/̶n̶o̶f̶e̶e̶.̶h̶t̶m̶l̶ (this link appears to be dead - try: https://www.ncdor.gov/taxes-forms/sales-and-use-tax/sales-and-use-tax-registration). You will be notified within 48 hours as to whether your application has been accepted. Feel free to forward this email to others you believe might be interested in participating. We are looking forward to the Festival and hope you will join us! If you have any questions, please email me drdanbarron@gmail.com or call me @828-284-1914 at your convenience. 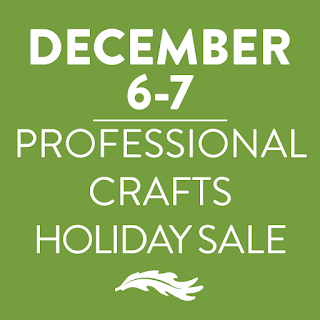 Join us for our annual Professional Crafts Holiday Sale Friday, December 7, 9:00 a.m.–5:00 p.m. Buy custom and handcrafted holiday gifts from our students in the fiber, jewelry, ceramics, and wood programs! Want to beat the crowds? 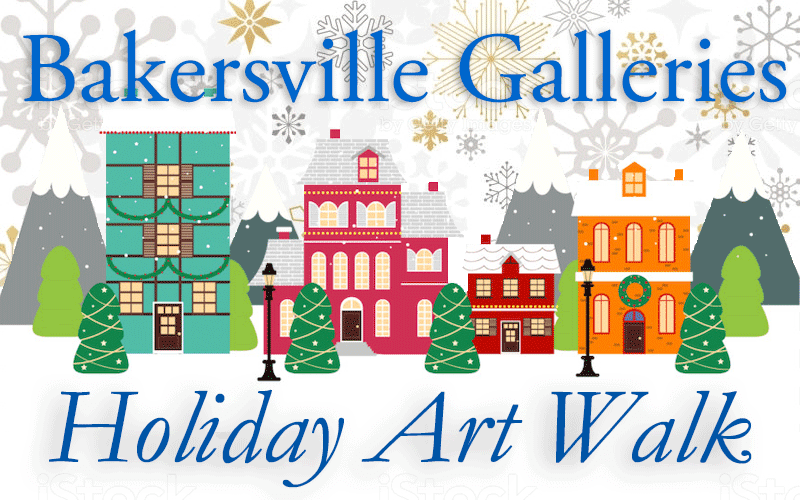 Visit us for the Preview Sale Thursday, December 6, 4:00-6:00 p.m. 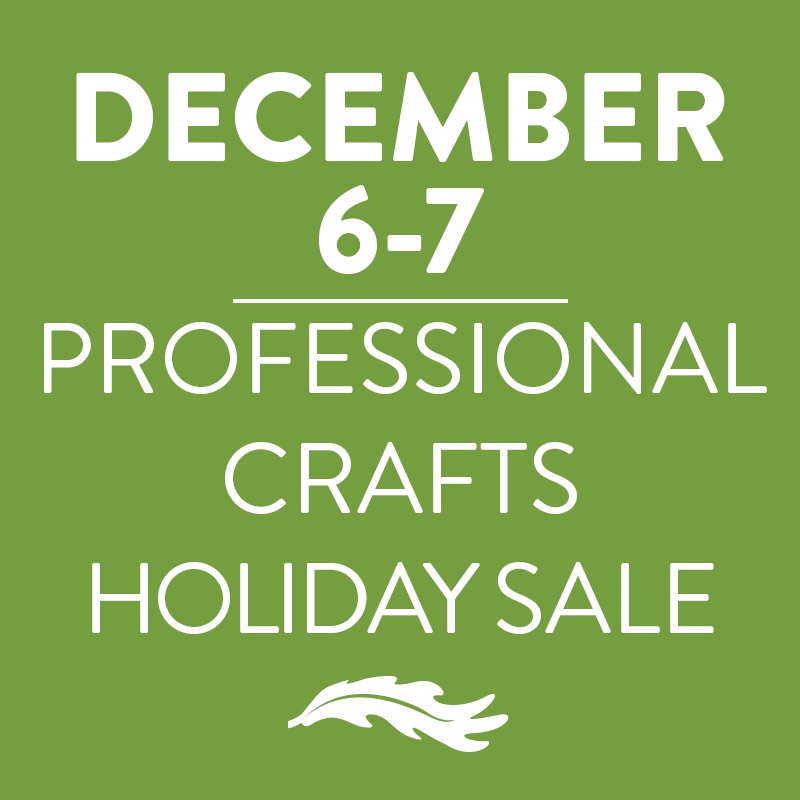 This student-led holiday sale is a valuable opportunity for students to practice the marketing and sales skills they learn in the Professional Craft program, as well as a fun way to engage with community members about craft. 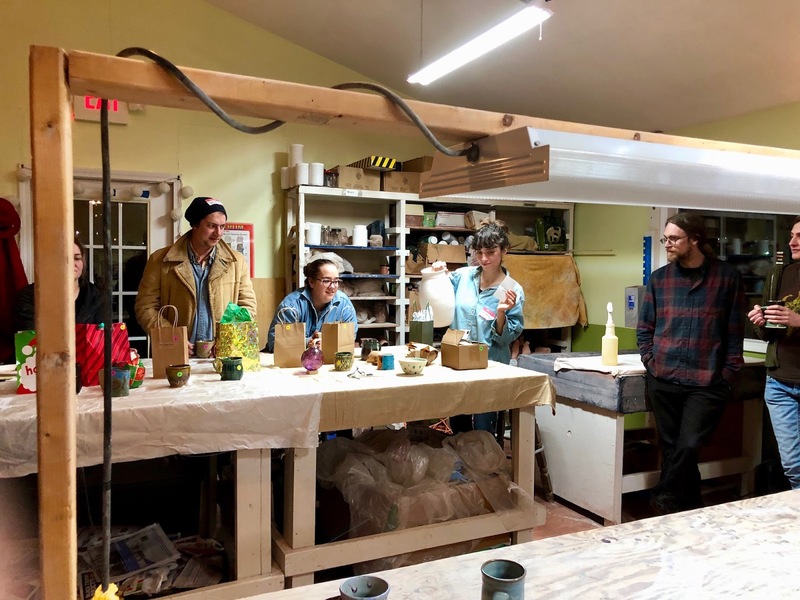 Clay Club meets at artist studios and other locations throughout Western North Carolina, usually on the second Wednesday of the month. 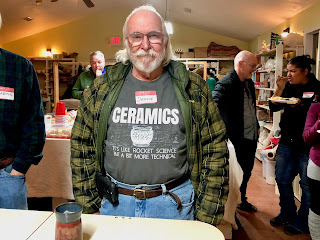 All potters and ceramic artists are welcome! 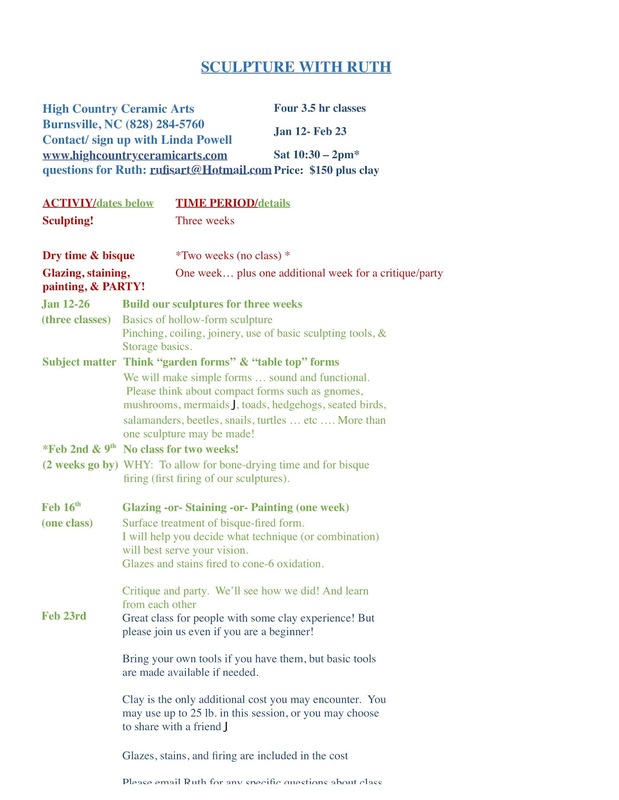 Look for details about the meetings here on the blog or contact Amy Waller at amy@amywallerpottery.com for more info. Just getting back from an Amsterdam workshop, pictured here, and 2 in Barcelona glaze workshos. Outstanding centers with great support and students, from Singapore, Norway, Turkey, Germany, Italy, Spain, Holland, etc. Amazing! Thank you all! Will be posting pictures later. Cauleen Smith’s Universe, Give It or Leave It, Honorable Mention Essay, 2018 New Art Writers Contest!